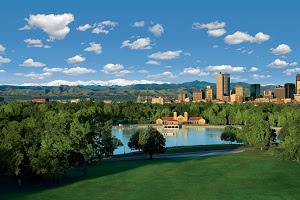 Denver Colorado is a city with 300 days of sunshine, brilliant blue skies and breathtaking mountain scenery, located at the base of the Rocky Mountains, 5,280 feet - 1,609 meters - exactly one mile high. History founded in the summer of 1858 by a small group of prospectors from Georgia crossing the great plains of the Colorado Territory who discovered Gold at the base of the Rocky Mountains. Although not much of the precious metal was found, the mere whisper of the word was enough to start a veritable stampede into the region. 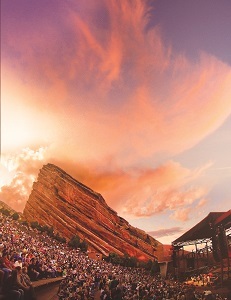 Red Rocks Park and Amphitheater concerts under the stars at this natural amphitheater surrounded by ancient rock formations, hiking trails and the Performers’ Hall of Fame. Observe a herd of buffalo in a natural setting, maintained by the city of Denver. The buffalo are direct descendants of the last wild buffalo herd left in America. 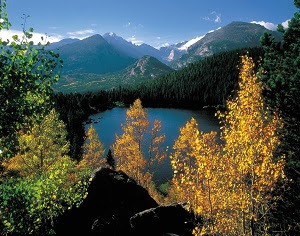 Rocky Mountain National Park 71 miles - 114 km - northwest of Denver, features 400 square miles -1,036 sq. km - of scenic beauty, including Trail Ridge Road, the highest continuous highway in the world crossing the Continental Divide at over two miles above sea level. Lariat Loop Scenic and Historic Byway is a 40-mile scenic circle in the foothills west of Denver connecting the communities of Golden, Morrison, Lookout Mountain, and Evergreen and a dozen enchanting historical attractions, including the Colorado Railroad Museum, Boettcher Mansion, Lookout Mountain Nature Center, Mother Cabrini Shrine and The Fort Restaurant. Arts and Culture highlights include the Denver Art Museum with its acclaimed American Indian and Western art collections, the History Colorado Center and its interactive exhibits including a virtual ski jump, or the Denver Museum of Nature & Science and the dinosaur in the Prehistoric Journey exhibit. The Buffalo Bill Museum and Grave one of the most famous cowboys to ever ride the range, William F. "Buffalo Bill" Cody epitomized the Old West. Upon his request he was buried atop Lookout Mountain, a site boasting one of the best views in all of Colorado. The museum opened in 1921, offering a look into life in the Old West, with exhibits on Buffalo Bill's life, the Wild West shows, Indian artifacts including Sitting Bull's bows and arrows, Western art, and firearms. Georgetown Loop Railroad is a reconstruction of one of Colorado's most famous railroads, which was originally built in 1877. Steam-powered locomotives make the climb up the valley and across Devil's Gate Bridge, giving riders panoramic views, and a glimpse into Colorado's railroad-centric past. Central City and Black Hawk are home to more than 30 casinos with blackjack tables, craps, roulette, poker games and more than 10,000 slot machines. The two cities are also known for some of the best-preserved Victorian architecture in the West. The American Mountaineering Museum experience mountaineering through interactive exhibits and high tech displays. Cross a crevasse, pick your route up Everest, and follow the footsteps of famous climbers as you prepare to hike in Colorado. Denver and Beer the miners and pioneers who flocked to the new city after gold was discovered in the Platte River were a thirsty bunch and the first city government was formed in a saloon called the Apollo Hall in Larimer Square. Coors Brewery in Golden can brew up to 22 million barrels and package up to 16 million barrels a year, making it the biggest single-site brewer in the world. Microbreweries Denver is known as the Napa Valley of Beer. 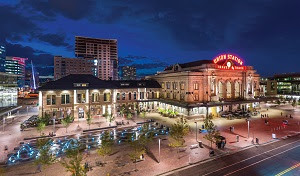 - On any given day, more beer is brewed in Denver than in any other city in the U.S. Today, there are 15 brewpubs and microbreweries in downtown Denver including the two of the largest in the nation.